You can now use polls in Instagram stories! Instagram has just launched a new interactive poll sticker for stories that lets you easily get feedback from your audience. Check out the image below to see how easy it is to use the poll sticker! Tap on the poll sticker -> Position where you want it to appear -> Customise the poll options -> Add to your story! This is a great way to track engagement within your story and could even let your viewers decide where the story will go next. To view the results of your poll, just swipe up as you would normally to check your view count, which will show all of the answers to your question. This will display how many votes each option got and even who voted for what. Poll results will disappear after 24 hours along with your story… however if your story is too good to just disappear, download Snappd or signup to the StoriesWidget which will save your Instagram story every 24 hours automatically. Looking forward to checking out all the polls in your Instagram stories! Edit. 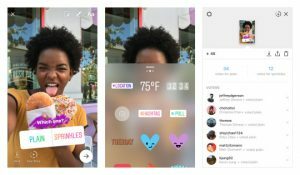 Along with polls, Instagram released two other features in this update including an improved colour picker and snap-to guide lines to help position stickers and text. The colour picker can be selected from the list of colours and lets you select any colour from the screen to be used in text or drawings. A great addition! Snap-to guide lines now appear when you try to position a sticker or text near to the centre or corners of the screen. This also helps to stop adding stickers that would cover up the message input area or other interface icons. Also a handy tool! Interestingly, whilst Instagram seems to be focused on improving the stories feature Snapchat seems to be looking more to AR with news of the app releasing a new augmented reality art platform.